“Best Shave Ice in the World.” Go ahead, Google it. 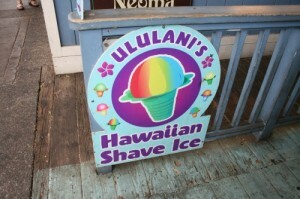 You’ll find Ululani’s Hawaiian Shave Ice at the top of the list. 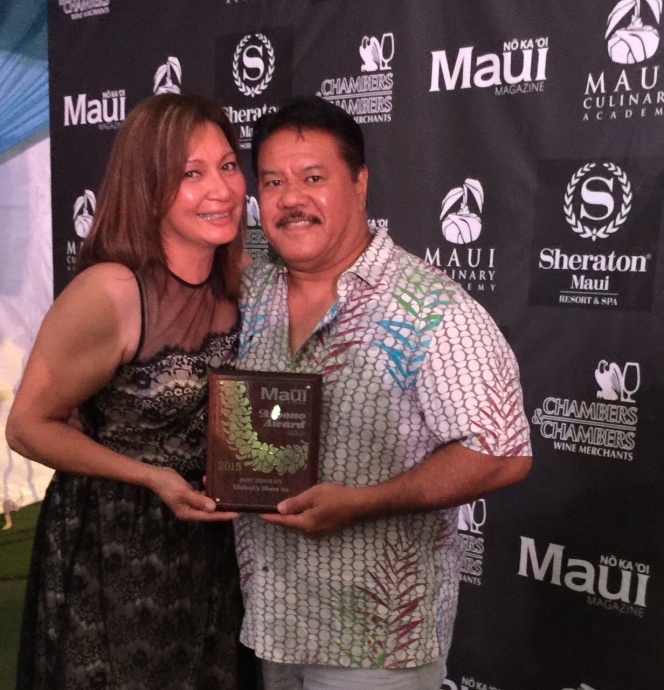 But despite all the awards and accolades on social media, travel sites and blogs, the leaders of Ululani’s remain humble, much like their beginnings. 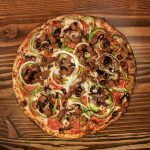 The business started in Vancouver, Washington in 2003, when Ululani and David Yamashiro of O‘ahu wanted to share a taste of home with residents up there. So they began making their super fine and natural shave ice at fairs and community events. With more staff, they opened Ululani’s 2 on Dairy Road in Kahului. The popularity of their ultra smooth shave ice and authentically natural flavors kept the momentum going. They opened a shop in Kīhei, replaced their Lāhainā store with a bigger Front Street location, and opened Ululani’s in Hyatt Regency Maui. 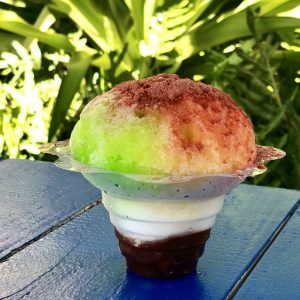 Shave ice shops with seating have also popped up in Maui Lani and now Pā‘ia. 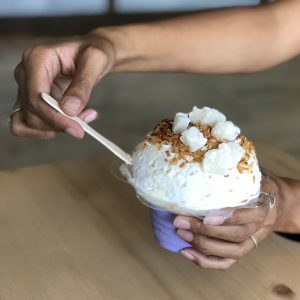 Locals and visitors alike rave about that experience: the amazing flavors; the pure, smooth ice; the warm, Aloha spirit…hence that whole “Best Shave Ice in the World” thing. “It’s like you’re eating a real piece of fruit, rather than artificial sweeteners or syrups, and that’s what really sets them apart,” expresses customer Celina Bailey. In fact, Ululani’s has become so popular, their video on Food Network Live went viral, getting over 28 million views! Also, owners have received more than 2,000 franchise inquiries from 49 countries. 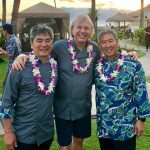 Ululani’s opened its first franchise shop on Hawai‘i Island, in Courtyard by Marriott King Kamehameha’s Kona Beach Hotel. There are also plans to have franchise operations up and running in Southern California and the Middle East in 2019. 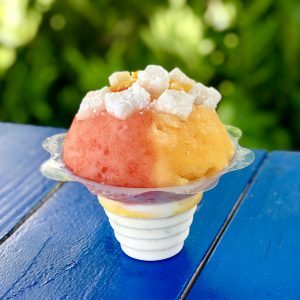 Sunset Beach, a popular combination at Ululani’s, with Roselani’s Gourmet Macadamia Nut Ice Cream, shave ice with Guava, Mango and Passion Orange, topped off with fresh mochi from Maui Specialty Chocolates. Courtesy photo. Ululani’s popular shave ice combination known as Haleakala, with Ube ice cream on the bottom, shave ice with coconut and leche (a non-dairy milk flavor with soft hints of cinnamon & nutmeg), topped off with snow cap (sweet cream mixture), toasted coconut from Sugar Beach Bake Shop and fresh mochi from Maui Specialty Chocolates. Courtesy photo. Ululani’s shave ice with All-Natural Calamansi, All-Natural Lilikoi and Lime, Azuki Beans on the bottom and Free Li Hing Powder on the top. Courtesy photo. Here on Maui, owners respect our island community and have implemented some eco-friendly measures, which you can learn about in the video above. Ululani’s welcomes everyone, from the single customer to large groups. It also offers catering services for weddings, lūau, birthday parties and corporate events. Customer Charles Tang says, like many of us, shave ice was ingrained in his childhood. If you grew up here, you remember the wooden spoons, which, incidentally, Ululani’s now uses again to reduce plastic. 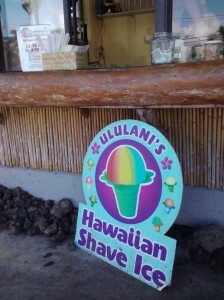 Learn more about the shave ice story and locations at Ululani’s Hawaiian Shave Ice website.